Safe Mode: Firearm will not fire. Semi-Automatic Mode: When the trigger is pulled, the firearm will fire. ECHO Mode: Firearm will fire when the trigger is pulled and will fire again after the trigger is released. Visit one of our Proven Arms & Outfitters locations, find us on the web at ProvenOutfitters.com, and follow us on Facebook, Instagram, and Twitter. 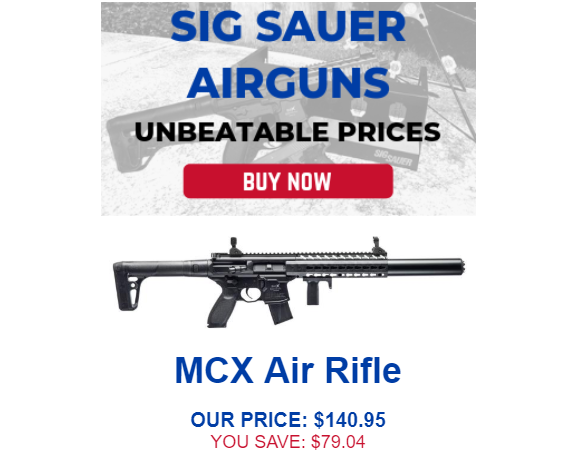 Tax Day Sale at Proven Arms & Outfitters. 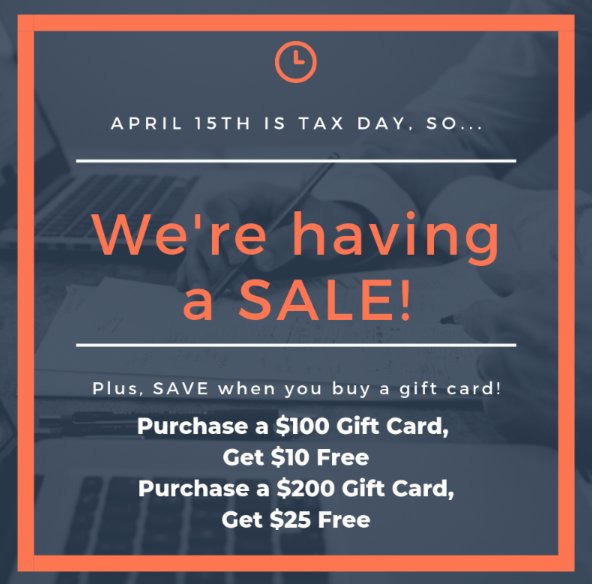 April 15th is Tax Day, so we’re having a SALE! ABERDEEN, N.C. – (February 2019) The Fostech Echo Sport is now available at Proven Arms & Outfitters. The Echo Sport trigger sold out in one day due to popular demand! The new shipment will be arriving within the next few weeks and is available for Pre-Order, which means you can order today and lock it in at the competitive price of $289.99. 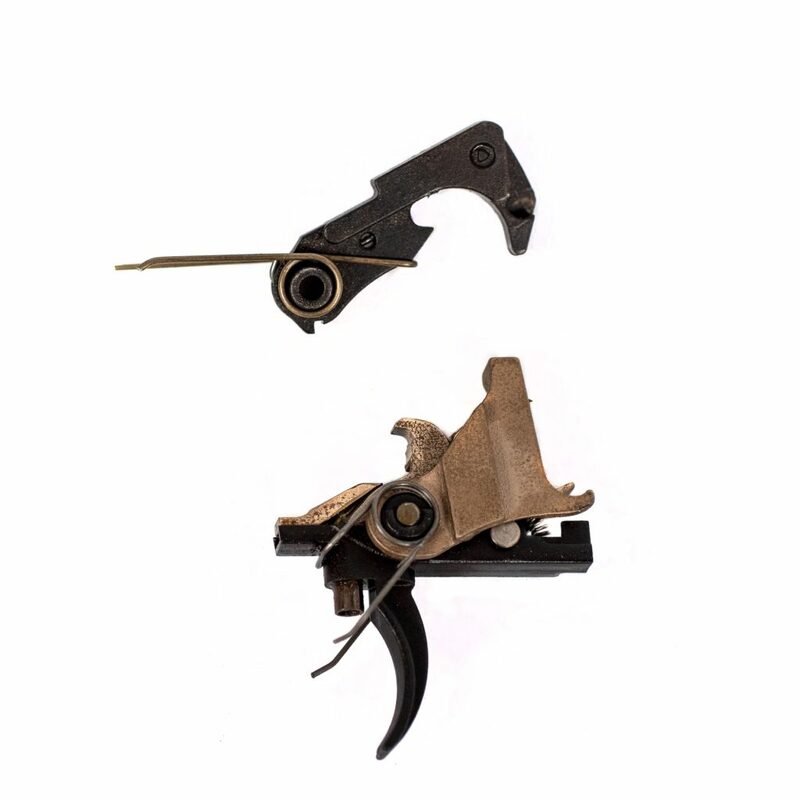 The Fostech Echo Sport Trigger is an economical pull and release trigger for the AR-15 platform. The Echo Sport has the functionality of the ECHO AR-II. The only difference is that you select the ECHO mode from the paddle rather than the safety selector. You can negate the second round but you do it off the paddle, rather than the safety selector. 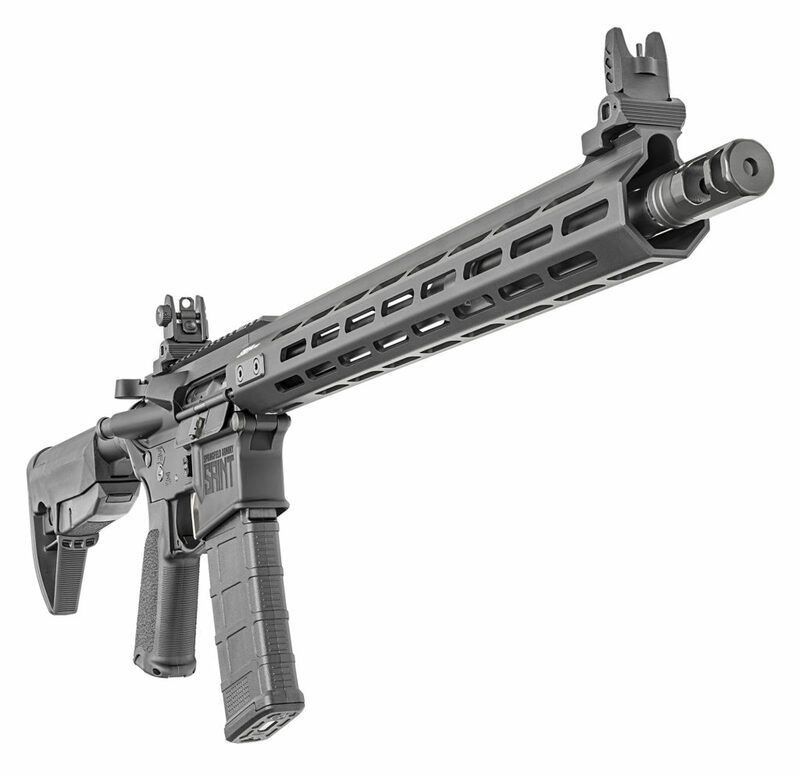 The Fostech ECHO Sport for the AR-15 gives you all the functionality with a more affordable price. The Fostech Echo Gen 2 trigger system allows shooter to select from 3 different settings. Semi-Automatic Mode : When the trigger is pulled, the firearm will fire. 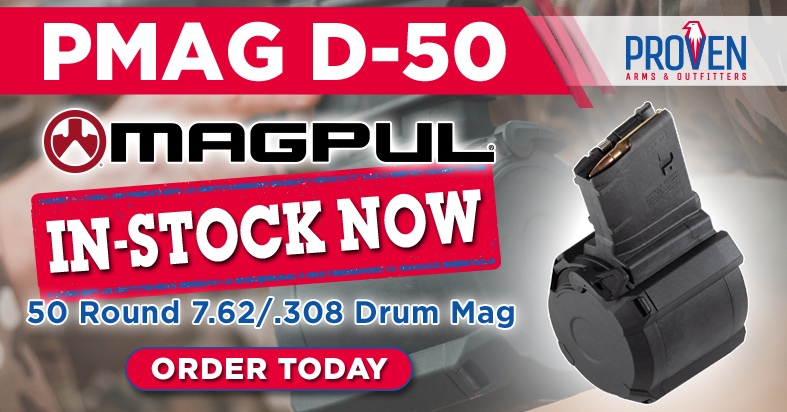 ABERDEEN, N.C. – (February 2019)- Proven Arms & Outfitters has the new Magpul PMAG 27 GL9 in stock and available online and at all locations. 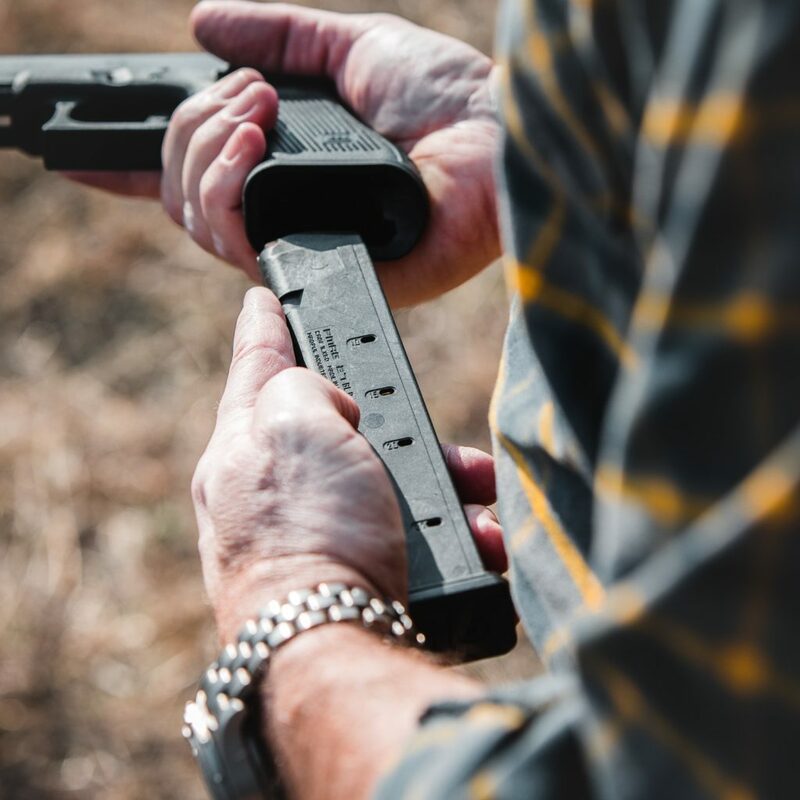 The PMAG 27 GL9 is 27-round Glock 9mm magazine compatible with all full-size, compact, and sub-compact double-stack Glock 9mm variants with some protrusion below the grip. Sig Sauer FOXTROT365 Weapon Light for P365 is now in stock and available online now and in stores soon! The FOXTROT365 mounts to the P365 models. 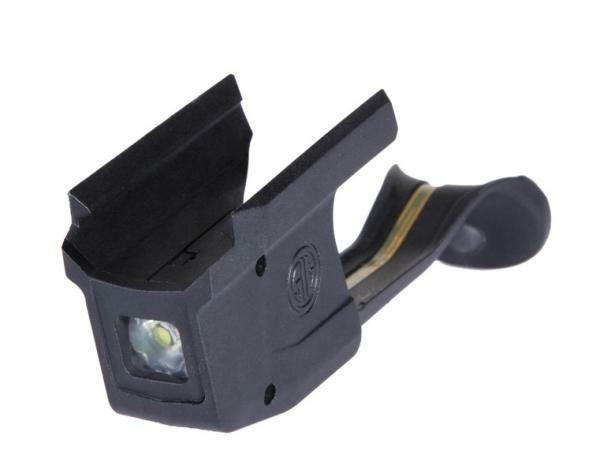 The weapon light is ideal for home defense, law enforcement or military applications and should fit most holsters designed for handgun lights. FN 509 Midsize w/Night Sights is now in stock and available online and in stores soon! 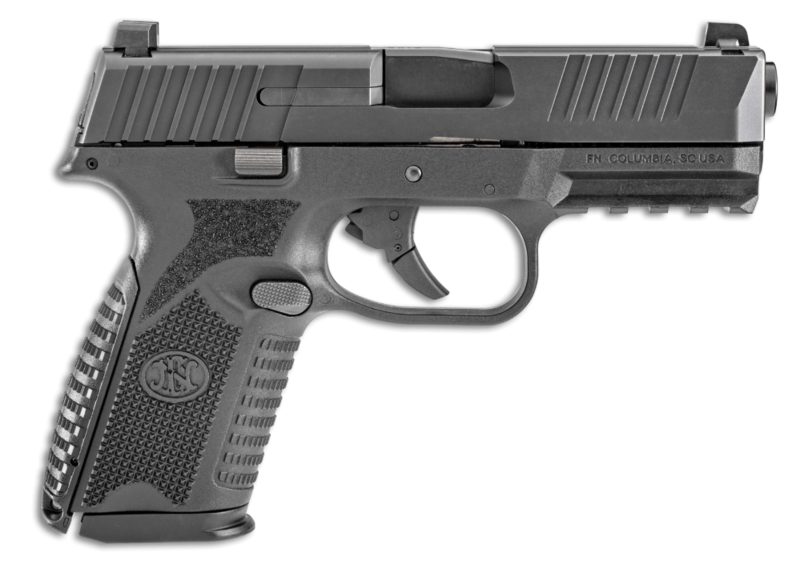 The 9mm pistol ships standard with 15-round capacity and is compatible with all FN 509 magazines with use of a sleeve. It is the ideal upgrade for your EDC needs. 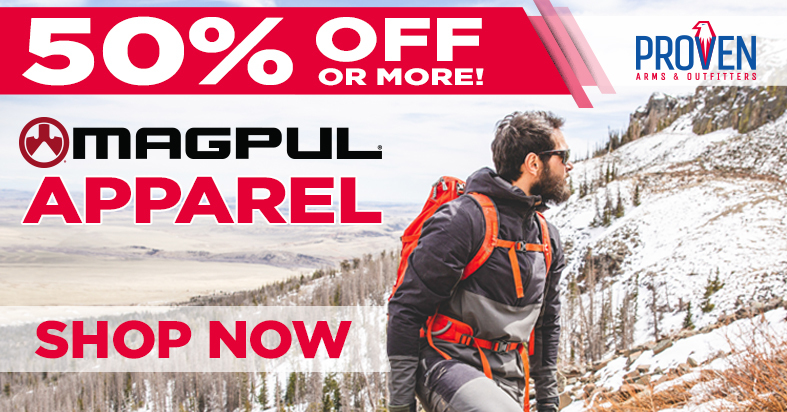 Don’t miss the Winter Clearance Sale, all Magpul Apparel is 50% off or more! 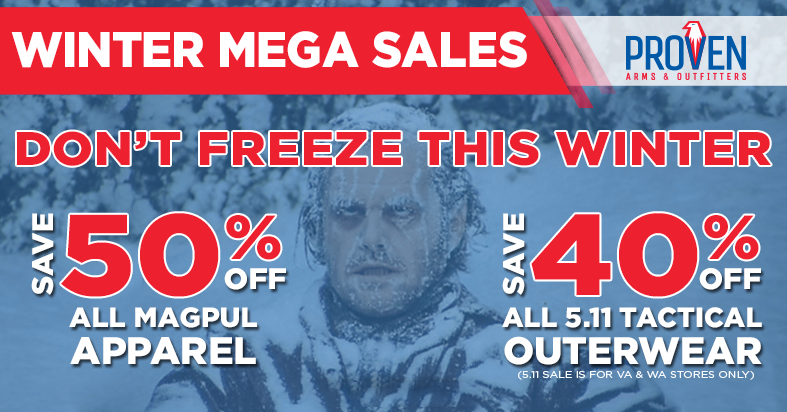 Virginia and Tacoma locations have 5.11 Tactical Outerwear at 40% off! Sign up for our email list and you’ll see the promotions and announcements first! These exclusive deals are while supplies last, so don’t miss out. 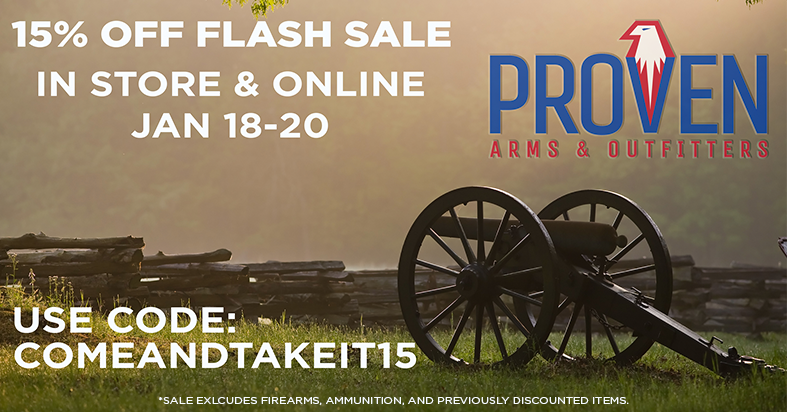 Visit Proven Arms & Outfitters to take advantage of their last sale of 2018. The M17-Commemorative Edition of the U.S. Army’s M17 official service pistol, a variant of the SIG SAUER P320 is now in stock at Proven Arms & Outfitters. The M17-Commemorative pistol shares the same components, coatings, and markings as the firearm that was awarded the U.S. Army contract for the modular handgun system (MHS). Only 5,000 M17-Commemorative Edition pistols have been produced for sale, and each SIG SAUER M17-Commemorative pistol is serialized M17-0001 through M17-5000 and includes the Army’s required unique identifier (UID). The M17 is sold in the same cardboard packaging as delivered to the U.S. Army. From the pistol to the packaging, the M17-Commemorative Edition is identical to the U.S. Army’s official M17 service pistol. We’ve been able to acquire a very limited number of the last remaining M17 Commemoratives in SIG’s inventory. They are on their way to us now. The last time we offered the SIG SAUER M17-Commemorative Edition, we sold out in 3 hours, so don’t delay if you want to add this extraordinary pistol to your collection. Please note, is a LE/Military/1st Responder Program gun. To purchase, you must be Military (Active/Reserve/Retired), LE (Active or Retired) or a 1st Responder. If you are unsure as to whether not you qualify, please contact us at 910.637.0500 or visit us on the web here. 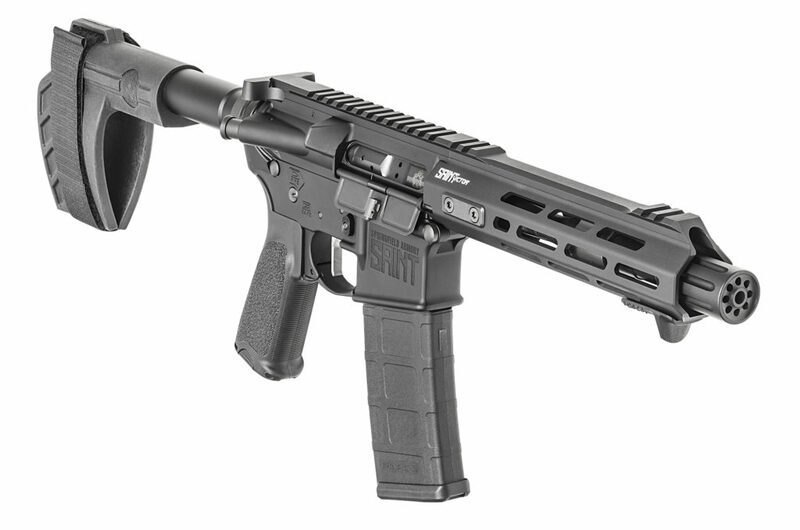 The SIG SAUER M17-Commemorative Edition Pistol is available at the program price of $825.00, which saves you $297.00! This is online only and limited to one M17-Commemorative per customer. 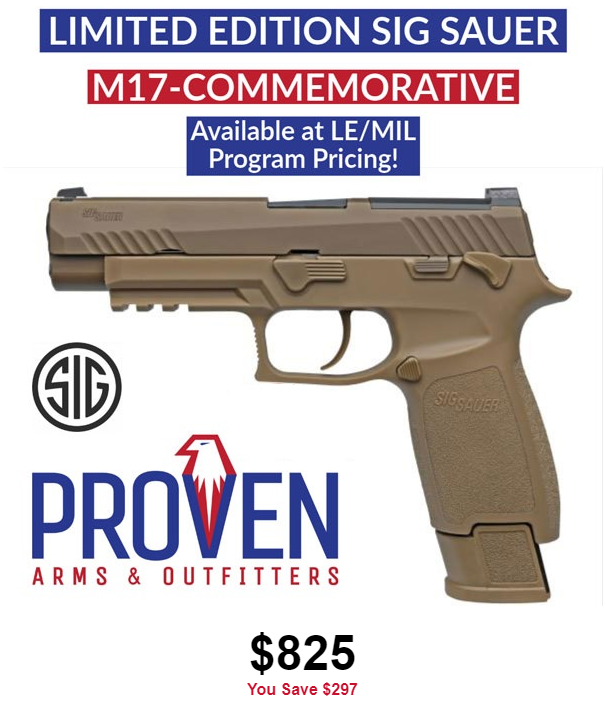 Get your Limited Edition, SIG SAUER M17-Commemorative pistol today at Proven Arms & Outfitters! ABERDEEN,N.C. 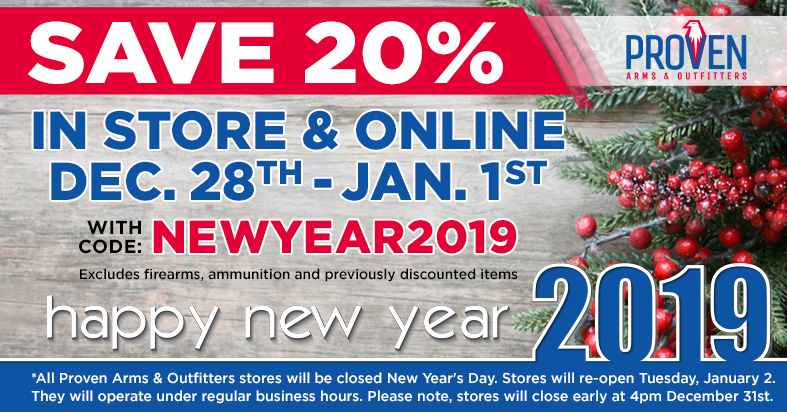 – (December 2018)- Proven Arms & Outfitters is excited to announce more holiday savings! Whether you are shopping for yourself or that special tactical/outdoor someone, Proven Arms& Outfitters (PAO) has just the thing! 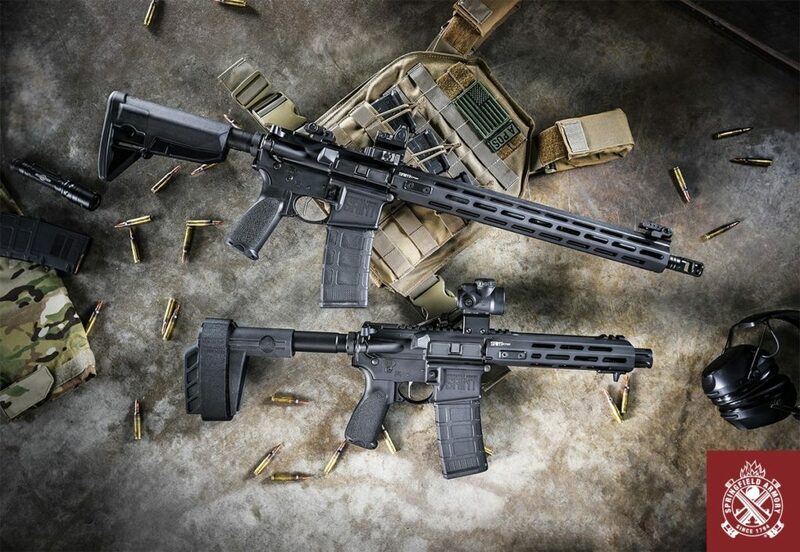 Check out the vast assortment of AR15 parts and components from Geissele, Aero Precision, Magpul, Anderson, and many other popular manufacturers. Tactical bags, packs, and firearm cases are always a great gift, and there are plenty in-stock from FirstTactical, 5.11 Tactical, Blue Force Gear, Pelican, and many other great brands. 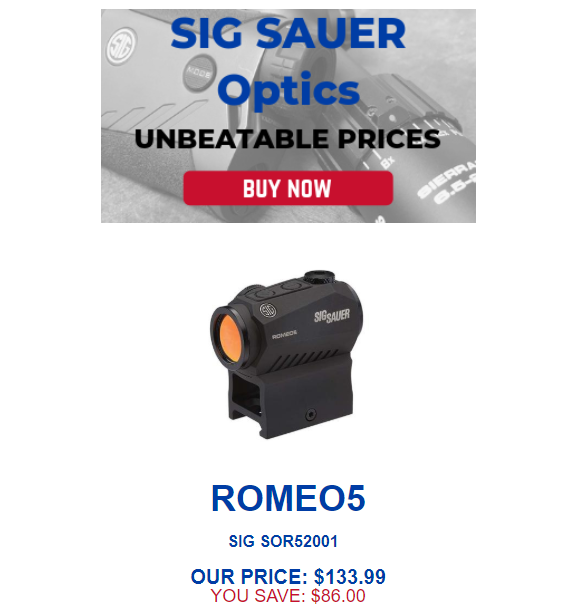 Don’t miss PAO’s current special on Sig Sauer P320s! Buy a full-size P320 and get a BlackPoint Tactical holster for $529.99 or K Rounds holster for $509.99. 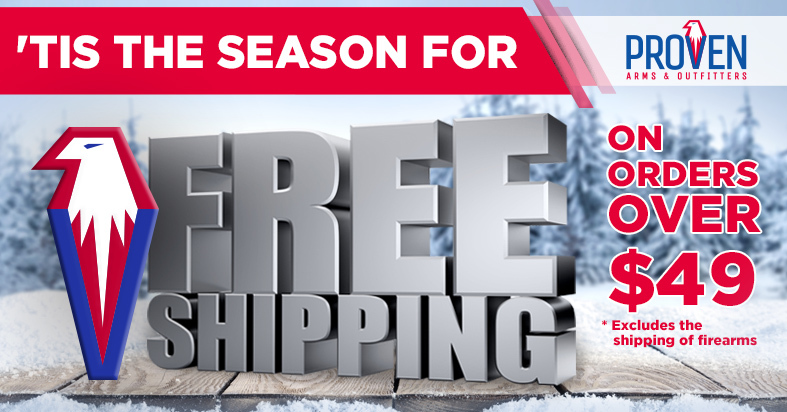 Each store location has a full assortment of ammo from Hornady, Sig Sauer, Federaland more at low prices. Ammunition is only available in store; we do not ship ammo. ProvenArms & Outfitters is proud to have a large variety of QualifiedProfessional Programs where law enforcement, military, first responders andmore can purchase firearms and essential gear at deep discounts. PAO holds programs with SureFire, Smith & Wesson, Sig Sauer, FN America, Springfield Armory, Berretta, and IWI. For more information on Proven Arms & Outfitters programs, visit ProvenOutfitters.com/Programs or call a store near you. Check out our stores in Tacoma, WA and Woodbridge, VA or shop online here. Stay tuned and look forward to more exciting announcements coming from Proven Arms & Outfitters soon!